The Crawford Fund recently caught up with Tamzin Byrne ‘in action’. 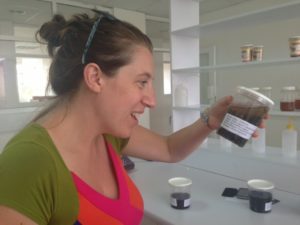 Tamzin is our volunteer Scope Global placement at the International Centre of Insect Physiology and Ecology (icipe) in Nairobi. The timing couldn’t have been better, with Tamzin involved in the Centre’s launch of the African Reference Laboratory for Bee Health by His Excellency William Ruto, Deputy President of the Republic of Kenya. 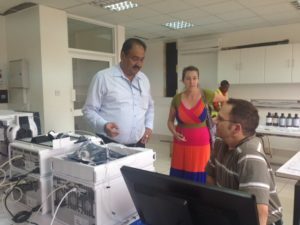 The lab is the centrepiece of a three-year €14.7 million project of international significance given current concerns around bee health, including Colony Collapse Disorder. Cathy Reade, the Fund’s Director, Public Affairs and Communication visited Tamzin in the days prior to the launch and was able to meet with Dr Segenet Kelemu, the centre’s Director General. Segenet is well-known to the Fund as she has previously been a Crawford Fund conference speaker and more recently received a L’Oréal-UNESCO For Women in Science award and was featured in the top 100 most influential African women of 2014 in Forbes Africa magazine. “This is the first time my work travels have meant I’ve been able to visit one of our 20+ communication volunteers during their placements. It was great to see how well Tamzin is managing, hear how much her work is appreciated and to find there are such exciting opportunities within the placement for her,” said Cathy. 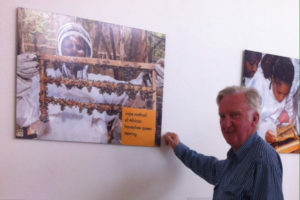 And the Fund’s CEO, Dr Denis Blight, was able to attend the launch of the bee facility, which is being set up to improve understanding of these unique creatures, boosting food security by protecting these important pollinators, as explained here, including the press release developed and managed by Tamzin. On the other side of the world, we have another group of Scope Global volunteers and mentors in Laos, working to boost plant pathology capacity, who will feature in short videos that are being developed with the help of Econnect Communication during a workshop underway. Stay tuned!